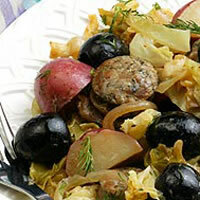 Turkey sausage is sautéed with potatoes, cabbage and spice in this savory one-pot meal. In a large high sided sauté pan, heat olive oil over medium-high heat. Add sausage and brown for 3-4 minutes, stirring occasionally. Add onions and continue to cook for 2-3 minutes, then stir in cabbage and potatoes. Mix in olives, beer, mustard, salt and pepper and bring to a boil. Turn heat down to low, cover and continue cooking for 20 minutes, stirring occasionally. Stir in chopped dill.